In the science is never settled department, the generally accepted measurement for the Gravitational Constant may be off by a little bit. A trio of researchers working in France, along with a colleague from the U.K. has re-measured the gravitational constant using the same apparatus they built 12 years ago and have found a small change. In their paper published in Physical Review Letters, the team describes how they reconfigured their original equipment to re-measure the gravitational constant and this time came up with a slightly higher number than before. The gravitational constant, denoted by G in math equations, has proven to be far more elusive than scientists imagined after it was first measured by Henry Cavendish approximately 200 years ago. The problem is that it’s far weaker than other forces such as electromagnetism. Fluctuating stronger forces acting on measurement equipment can cause changes to readings, leading to an inaccurate result. For that reason, scientists have been striving to come up with a way to definitively measure exactly how much force G exerts. In this new effort, the research team went back to the same apparatus they constructed 12 years ago—one that simultaneously measures G in two different ways. This time around, however, they reconfigured their device in ways they believed would make it more accurate—and in so doing found a slightly different result, but now, aren’t sure which of their measurements is actually more accurate. Modern researchers use two main types of methods to try to measure G, the first is a more advanced way to do the same thing Cavendish did two centuries ago, using lasers instead of candle light—it’s based on measuring the amount of torque applied to a thin ribbon set between heavy balls. The other involves applying voltage to a wire using a servo to counteract twisting due to G. In this renewed effort, the researchers ran both types of measurements in their device and averaged the results. In so doing, they discovered measurements revealed a value of 6.67545(18)x10-11 m3 kg-1 s-2, with 27PPM standard uncertainty. This value is 21PPM lower than the last time they ran the experiment (measurements by others have ranged as far as 241 ppm lower). The team is unable to explain why they found a difference, and cannot say with confidence which of their measurements is likely closer to G’s actual value. Research into ways to better measure G will continue of course, with the hope that one day a method will be devised that will not be subject to other more powerful forces, or interpretation. What is the Gravitational Constant? Basically the Gravitational Constant or G is a constant in the equation used to calculate the gravitational force between two objects. It would probably be best to begin with the man who discovered gravity, Sir Isaac Newton. where F is the gravitational force between two objects, m1 and m2 are the masses of the two objects and r2 is the distance between the two objects squared. G is, of course, the Gravitational Constant. The metric unit of force is the newton. One newton is the amount of force needed to accelerate one kilogram by one meter per second per second. If the distance is measured in meters and the masses in kilograms than G is approximately 6.674 X 10-11 N(m/kg)2. Newton was not able to measure G. As the article states, the first person to actually determine G was Henry Cavendish. Cavendish was a shy and somewhat eccentric man whose social life consisted almost entirely of attending meetings of the Royal Society. He was so shy around women that he could only communicate with his female servants by writing notes and he supposedly add a back staircase added to his house to avoid meeting them. Despite these eccentricities, Cavendish was able to make several important discoveries. He discovered the element hydrogen and helped disprove the long standing phlogiston theory in chemistry. He studied the transfer of heat and helped to develop the science of thermodynamics. He also attempted to determine the average density of the Earth so that he could estimate its mass. It was during the latter experiment that he determined the gravitational constant, thought he expressed G in terms of Earth’s density. 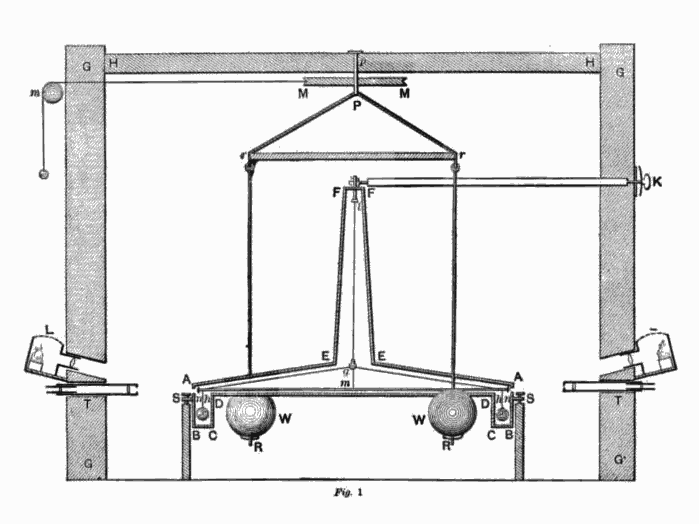 Cavendish’s method consisted of a torsion balance made of a six foot long wooden rod on which were suspended two lead weights around 1.6 pounds. Two larger lead weights of around 350 pounds were suspended on a separate balance next to the smaller balls. With this device, Cavendish was able to measure the very small gravitational attraction between the weights. 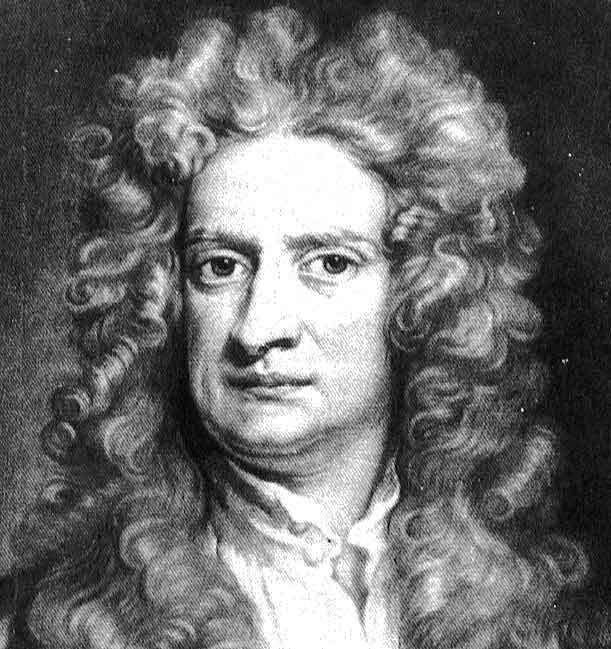 His result was almost identical to the present measurement of G. The problem is that the force of gravity is so weak that it is very difficult to get a really accurate measurement of the gravitational constant and as a result, scientists have not been able to improve very much on Cavendish’s results. Even with more accurate equipment and more advanced technology, the best measurements often get differing results. You may wonder how gravity could be considered a very weak force. After all, it is the force that holds us to the ground, the Earth in its orbit around the Sun, and creates black holes. The truth is that gravity is considerably weaker than the other fundamental physical forces of electromagnetism, and the strong and weak nuclear forces. Think of it this way, a small magnet can hold a piece of metal against the gravitational force of the entire Earth. Gravity is 10-36times weaker than the strong nuclear force, that’s .000000000000000000000000000000000001 times weaker. By contrast, electromagnetism is only 100 times weaker that the strong force. Why gravity is so weak is one of the unanswered questions in physics, though it is a good thing for us that it is so weak. If gravity were very much stronger, the universe would have collapsed in on itself shortly after the beginning and the Big Bang would have been a big fizzle. This entry was posted on September 24, 2013 at 8:33 pm and is filed under Heroism, History, Physics, Science, What's Happening. You can follow any responses to this entry through the RSS 2.0 feed. You can leave a response, or trackback from your own site.